Headphones are the bread and butter tool for monitoring audio in video production. Professional quality, closed-backed headphones help isolate ambient sounds. A pair should be in every sound kit. However, so many crews — especially younger ones doing TV news — don’t use headphones at all. Whenever I see this on the street, I stop to ask why? Inevitably, I’m told headphones are not needed since the sound operator only needs to watch the VU meter to ensure good sound. Of course, that answer is pure hogwash. Untrained amateurs are the only people who would say something like that. The only way to ensure high quality sound for video in the field is by carefully monitoring with headphones. In this article, we cover several audio flaws that can ruin video and are easily missed without using headphones. First, whenever going on a video shoot, make sure there are ample spares to all the gear. You’d be amazed at how many TV news crews forget to bring along even an audio cable! It is basic to always keep a clean, organized audio kit ready for unexpected shoots. 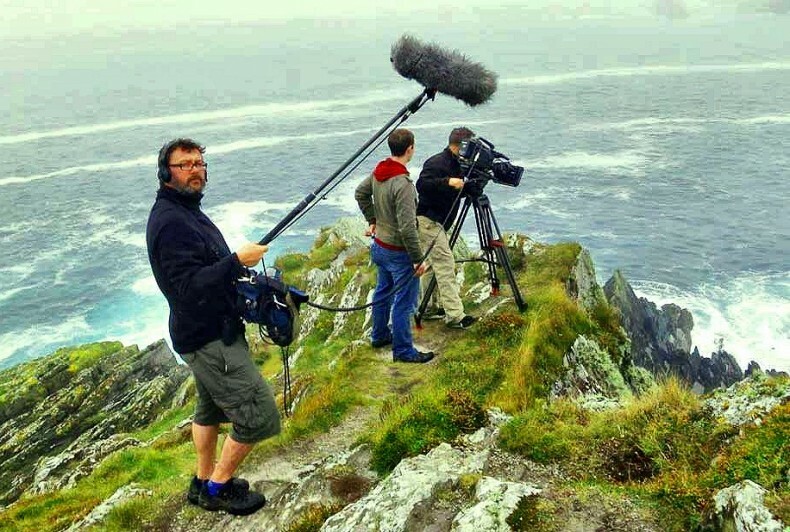 Stephen McLoughlin, freelance location sound recordist based in Ireland. After set-up in the field, get test audio levels on each new location. The average level should be around -12 to -9 dBFS. These levels provide a good noise floor and adequate dynamic range. Then record a minute or so of ambient sound for the editor, who may need to do fixes in post. Remember, never record digital audio at over 0 dBFS. If that happens, your audio goose is cooked. Avoid these obvious audio mistakes, which can’t be fixed in post. They include bad, noisy microphones, faulty mic cables or dead batteries in components. Again, these are caught only by careful monitoring. Without headsets, these problems are likely to be discovered too late. Plosives and sibilance are revealed by headphones. These errors do not show up on VU meters. Pop filters and wind protection are essential to prevent these annoyances in video. Wind protection can reduce the impact of the higher sibilance frequencies. Also, changing the microphone can reduce these effects. Always have spare mics nearby. The goal in the field is to get audio dialog that is crisp and clear. Muffled audio can create major problems in post. Always make sure the microphone used to record video sound is on-axis. This is why shotgun microphones are so popular in the field, since they have a reduced off-axis pickup. One of the worst enemies of video sound is wind noise. Wind can destroy audio and come out of the blue at any moment while shooting outdoors. Always be ready to handle a mic’s exposure to the wind. There are many wind protection tools for each kind of microphone being used. They range from a “dead cat” covered zeppelin wind assembly for shotguns to thick furry covers for lavs. Be sure to have them all in the sound kit. On the audio mixer, the low-cut filter can also help reduce the noise of cars, airplanes, traffic, construction, rainy-windy climate and background conversations. You can’t distinguish these distractions without headphones. Listen for these sounds and cut them as much as possible at the source. If the low-cut filter won’t do the trick, try some frequency specific EQ if possible. But be careful not to degrade the overall sound. Careful listening through headphones is essential for good video sound. Anyone who tells you otherwise is dead wrong. Knowing how to listen for problems is the first step in recording better audio for video.